Welcome to our countdown to the most anxiety-inducing horror films for parents! Today is day twelve. Okay, before we even get started, I admit, today’s entry is a bit more serious than the others so far, but don’t worry, we’re just clowning around. Yes, we are talking about the stupid, evil clown movie. I know, I know… it wasn’t even THAT GOOD, but dude – I can’t. Not anymore. 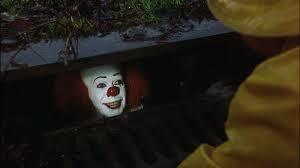 I’m not even afraid of clowns and this movie freaks me out. Actually, if I’m completely honest, that might not even be true… it isn’t the movie itself and it isn’t the clowns, it’s the idea of the kidnappings and how/where they happen. When I first saw this movie, it was a mini-series on network television and I was a child. A home-schooled, sheltered, innocent child who knew absolutely nothing about the world. I saw it from my perspective and the older brother was the most relatable character. The clown didn’t scare me as much as the way the child had been lured away so easily and the haunting image of that red balloon stuck with me for years. Now that I’m grown with children of my own, I see it from a new perspective. A helpless parent perspective and there is a good reason why I have never been willing to be a helpless parent but instead, a proactive, protective and cautious parent. There’s reasons why I park 10 feet away from storm drains and white-knuckle my kid’s arms as we walk over them (which only happens if it’s completely inappropriate for me to walk a few feet around them to avoid them altogether). Anyone who has ever driven with me can attest to the fact that I will go around in circles looking for a parking spot to open up, even if there is one right in front of the place I’m going, if it sits right in front of an open storm drain. I have told both of my children not to play near them, put their hands in them, not to look too long down the holes… and the reason is that creepy, anglerfish-demon-monster-spider with a clown lure. Oh, have I mentioned I have severe arachnophobia? Heh.. yeah, there’s that, too. So, what else is there about this movie that is so disturbing? Well, two things. 1- Kids don’t listen. The kids in this movie are constantly putting themselves in harm’s way. It’s a parent’s freaking nightmare with the whole, “let’s pretend we’re monster killers and go after the creature that stole baby brother” thing like they actually had a single chance in hell of being successful. Look. I get it, it’s a movie. That’s cool, I mean, really – who didn’t want to be a member of The Goonies or ride around in the Mystery Machine when we were kids? Total daydream, right? Except for the fact that in real life, here in 2016, if some kid decides to take a cue from this movie or any of the other “kids save the world” 80’s nostalgia flicks thinking they actually CAN beat the bad guys, they’re gonna wind up dead. In real life, bad guys have guns, knives, zip-ties, the dark web and way too many connections. My advice for kids today thinking they can fight this kind of danger? These people’ll kidnap you and whisk you away to the land of child trafficking and slavery faster than you can say “Scooby Gang”. Don’t assume for a single hot second that you can hold a candle to their expertise. I guarantee you that your desire to solve a “mystery” will never match these creep’s desires to not be caught and put into federal prison which means the likelihood of you dying is much higher than the potential of you and your Jr High gang actually being able to save your kid brother from certain doom. Unless one of you is the chosen slayer of your generation, stay the hell home. 2- FREAKING CLOWNS ARE ALL OVER THE NEWS!!! Guys… this is not a joke. It is not okay, it is not funny, it is not “no big deal”. People in clown suits are walking around towns, ALL OVER the country, (hopefully) just to scare you. That in itself isn’t such a big deal, but when the people in clown suits start actually doing terrible things like committing robberies, attempting kidnappings and forming gangs while threatening to commit random acts of violence just for fun… the clowns have gotten out of control and according to today’s news updates, it appears to not be slowing down. Why does this bother me? Because people who genuinely do want to cause damage, inspire actual fear and possibly engage in criminal activity are going to take advantage of this new fad to dress up like scary clowns and lurk in order to get away with their nefarious activity. This is not paranoia. This is understanding the psychology behind people who like to do bad things. I recently spoke to a specialist in the field of mental health for the criminally insane who absolutely believes we should take this whole thing very seriously. Why? This is exactly the kind of thing the people she deals with every day absolutely long for in our society, she said. It’s an excuse to get away with terrible things because no one suspects you until it is too late. If it continues she said, there is no doubt we will see a rise in criminal activity from these seemingly harmless nuisances. An attempted kidnapping of a 1 year old by a clown took place just last week. This morning, a “clown gang” announced they are going to be engaging in crimes and let people know to “just wait for it”, as they will be here soon. As of yesterday, 39 states in the US have experienced “creepy clown” sightings with no indications the fad is going to let up anytime soon. This makes any parent a little more ill at ease, especially with Halloween approaching and not because anyone is actually worried about a giant spider monster hiding underground. So many people will already be in costumes and how will we ever be able to tell the folks just having fun from the ones who are trying to steal our children? The sad truth of it is, we can’t. After scary clowns were spotted in front of a local elementary school here in my own town, I decided it was time to include costumed characters in my list of “stranger danger” people with my children for the first time. Some may consider this unnecessary, but I say, why take a chance when it’s so easily preventable with a few measures of precaution taken? So…. where are the clowns? Should we send in the clowns…? Tomorrow, we continue on the path of truth hidden in fiction where we will talk about one of the most notorious houses in the country. Keep an eye out for tomorrow’s romp into the spirit world where true stories and haunted tales that make mothers cringe come together.